Welcome back to Arrow Squad! This week, the triumvirate is a dumvirate as I, Miss Ice, was unable to join the boys for the discussion of Arrow Season 4 Episode 15 “Taken”. It’s been a weird month of work and personal issues, but I hope to see everything going back to a normal schedule soon and finishing out season 4 of Arrow strong! This episode of Arrow originally aired on February 24, 2016 and features the DC Comics hero Vixen, who is portrayed by Megalyn Echikunwoke (a.k.a. Megalyn EK). To see more of this character, I encourage you to check out the Vixen mini-series on CW Seed! It is definitely worth a watch. Overall, I actually did enjoy this week’s episode. Reactions were on point, no one held back, and there was enough utilization of Vixen’s character to make the crossover worth it. That said, it is the details that bug me. The details, the small things, have such large implications for the future, and I do not like how they come together in order to orchestrate the drama. The action has taken a back seat to relationship drama brought about by small details that are absurd and out of character. For once, little time is required to debate what is meant by the episode title. William Clayton, Oliver’s son, is taken by Damien Dahrk & Co. (specifically, we learn later in the episode, by a one-armed man…). 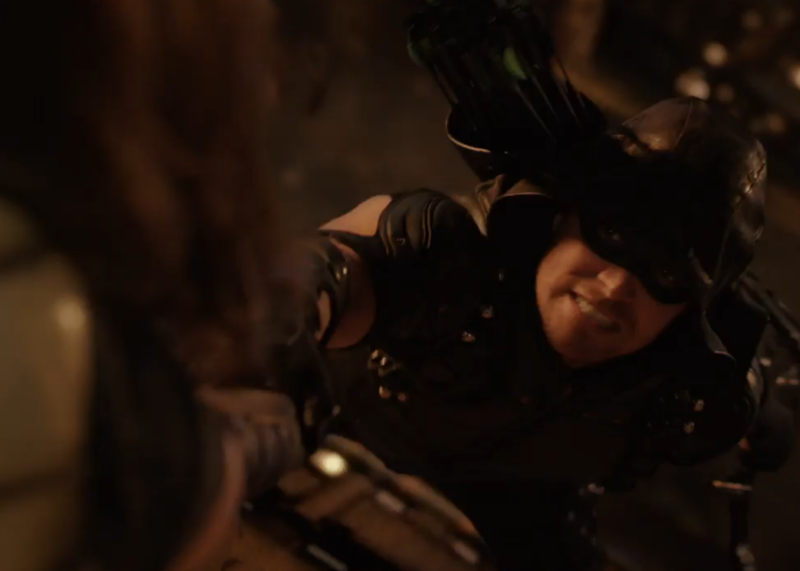 The episode revolves around Oliver’s efforts to reclaim his son without losing his claim on life as he knows it. There was little doubt in my mind that the decisions made by select characters over the course of the first half of season 4 would lead to results other than what we witnessed in this episode. Samantha’s ultimatum put Oliver into an impossible situation and essentially caused the fallout in this episode. Because William was kept a secret from the world, Damien Darhk was able to take advantage of Oliver’s desire to keep him a secret; because William was kept a secret from Felicity, she was exposed to just how damaging Oliver’s penchant for secrecy can be. While I’m not surprised at Felicity’s decision to give Oliver the ring back, I am a bit miffed at the explanation she gave him. In the course of putting myself into Felicity’s shoes, I cannot come to a great conclusion of how I would react in that situation…but I am reminded of how a similar (logistic) scenario played out in Gilmore Girls (which I won’t go into, because this doesn’t seem like the right audience…) and know that there are likely unlimited ways for women to handle the news that their soon-to-be has a child. Felicity tells Oliver that while she understands he was put into this no-win situation, it doesn’t change the fact that he excluded her from the decision. This I resonate with; I’d want my significant other to want my insight. Or, at the very least, want me to help him sort through options. What I don’t quite get is how someone, who is as in love with another person as Felicity is with Oliver, can simply (and literally) walk away. I get taking some space, I get needing to re-evaluate and even post-pone pending nuptials, but I don’t understand–knowing what Felicity knows about Oliver–the absoluteness of handing back the ring. On the other hand, I also see how Felicity’s view of the world is very black and white. It’s all or nothing. It’s truth, or it’s a lie. It’s how she reacted the first time she found out about William in the erased timeline, and that was 30 seconds after Oliver had found out himself. So while Oliver makes too many allowances, Felicity doesn’t make enough. I’ve hesitated several times while writing this out, because I don’t want to be unfair to either character. Shadow was upset with Felicity’s out of character comment last week (the “Because you’re a man…” comment to Captain Lance), and this week I’m just upset with her rationale. She entered into this relationship with Oliver knowing who he is and what his tendencies are. 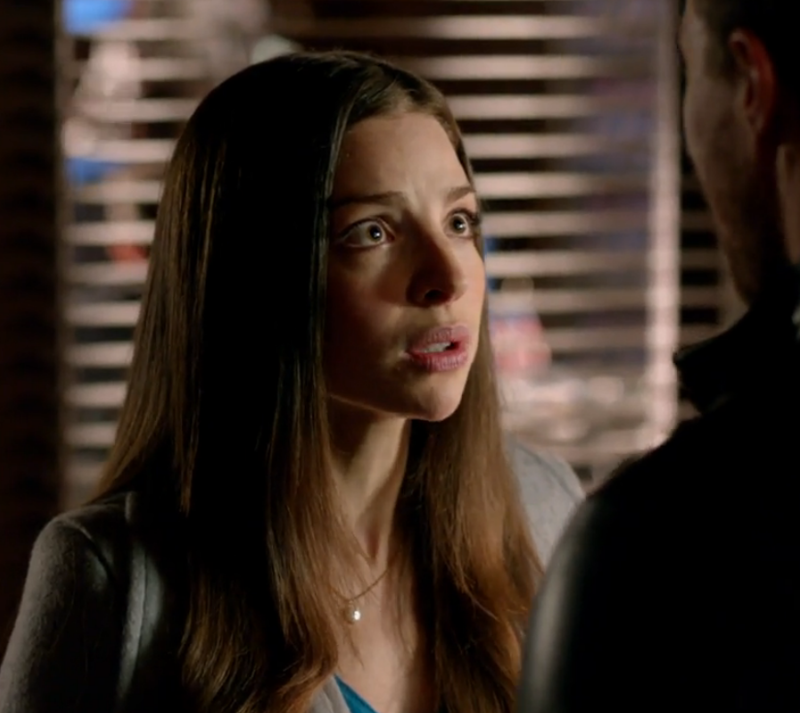 And that is NOT me saying “she’s getting what she deserves”, but rather she knows that Oliver is prone to secret-keeping but is in fact making tremendous efforts to change. Instead of acknowledging that change is possible, based on what she’s seen from him, she decides he won’t change. Felicity has charge of her own life, and every person has the right to make the decisions he or she needs to in order to function and maintain their own sanity. I’m also not necessarily trying to defend Oliver’s actions; if you’ve been listening to Arrow Squad you’ll know that I disapprove of him rolling over to Samantha’s demands. What always bums me out is when people choose to give up instead of seeking out ways to improve a situation. Since Felicity and Oliver got together, and not counting the erased timeline, there have been very few moments in which Oliver has disappointed Felicity. I’d actually really like it if someone could point out one such instance to me because I’m having trouble thinking of any at the moment. This isn’t a big mistake at the end of a long line of big mistakes… this is a big mistake after a long period of self-improvement, which was initiated because of his love for her. For a show about superheroes, I’m spending a lot of time on the love story aspect. Honestly, what else are they really giving us right now? The animated web series, available on CW Seed, is a great watch. It is a solid origin story about Mari McCabe and how she comes about the magic that allows her to channel the characteristics of animals. The live-action version of Mari, a.k.a. Vixen, was very well done. The ghostly phantoms of the animals she channelled were awesome, even if the actress’s physicality left much to be desired. I’ve been complaining for several episodes that Team Arrow is attacking Darhk in the same way, over and over, and expecting different results… and finally! Felicity agrees with me. The introduction of Vixen finally has Team Arrow fighting magic with magic, and altering their approach even if they’re not entirely sure of what the approach is they’re taking. The interest that Mari has in her own talisman enables her to postulate that Darhk may have one of his own… But again, they jump from potentiality to actuality to success within a matter of minutes, making it seem so incredibly weird that they never thought of this before. That Constantine didn’t think to mention it. All along it was as straightforward as stealing Darhk’s magic mojo? The real qualm I had with Mari’s character was in the advice she gives to Oliver as it pertains to his son. Oliver is highly susceptible to taking the advice of people who agree with him, which is why I so severely despised Thea siding with him. What has made this show work from the beginning was Oliver teaming up with people who thought differently than him in order to balance him out. But now, all of a sudden, everyone is agreeing with him. Well, I guess I should clarify. Oliver told Felicity that he thought he should keep William close after everything that has happened, but really what Oliver “wants” is whatever will keep Samantha “happy” so that he might eventually have a “real” relationship with his son. Because he has no true conviction of making Samantha do something she doesn’t initially want to do, he’s susceptible to Mari’s diatribe that giving William a chance at a normal childhood would be best for him. In spite of all the personal growth Oliver has undergone since the close of last season, he’s almost been, in a sense, castrated. The decisions he’s making are in the interest of keeping select parties happy; he’s not making decisions with conviction, but out of personal obligation; and he won’t take control of situation that will give him an advantage. While I don’t want the Green Arrow to be a killer, he definitely does not have the edge that made him a protector in the first place. Particularly when it comes to the most villainous villains he’s faced thus far. The diversity of reactions within our community this week alone is so interested to track. From Facebook to Twitter to feedback submitted to the podcast, we love all forms of communication. If you need to react to an episode of Arrow, don’t hold back! Use our feedback page to let us know what YOU think!! 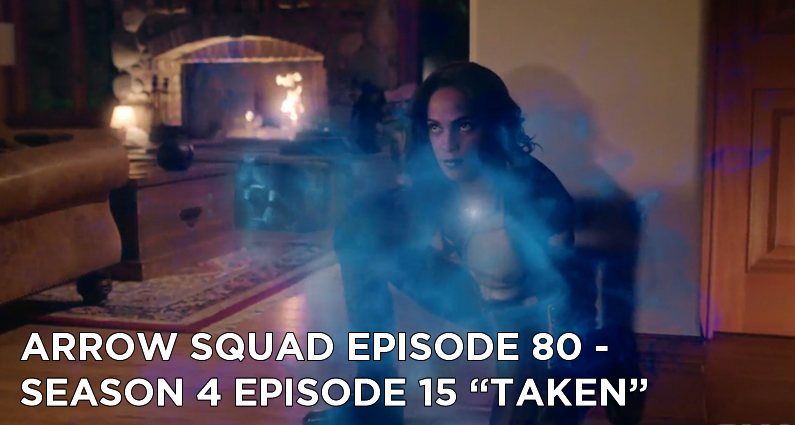 “I think Vixen kind of stole the episode.” – fair comment from Shadow. For those who have seen the “Justice League: Unlimited” cartoon, how did their version of Vixen compare to the “Vixen” CW Seed version; did you enjoy one more than the other, if so why, or did you enjoy both? I look forward to the convention reports. I hope you get to go to Dragon Con Shadow, it’s a lot of fun. Donna is awesome…I’m going to miss her. I will definitely be disappointed if this is the end of Felicity’s paralyzed arc; as Overload said the writers have been doing an excellent job of dealing with this in a realistic way and so if this is the end of that arc it’s going to be slightly disappointing honestly only in the respect that it’ll be too short in my opinion. It’s great handling in every other way, but if this is it for the rest of the series I will be sad it was over relatively quick. I like Shadow’s theory regarding Darkh’s powers. I’d definitely take another appearance from Vixen! I love the Green Butterfly’s comment about the rain/no rain on the characters scene. I also loved Overload’s comment about how it would have been just as powerful a scene if Felicity rolled into the elevator and they did a quick shot of her foot twitching; I am choosing to have faith in the writers that they will have Felicity affected again in the future so I don’t mind this walking bit as much if she has issues later as if again this was it because that would be frustrating. I hope we see the others talking to Felicity about the break because they are her friends too and it would be really sad to see that story being told through Oliver with the group and Donna with Felicity; I realize Felicity may not want to talk to the group about this, but I’d love to see them still trying. I love Donna and Felicity, but I’d love to see Donna letting Oliver have it before trying to help him get back together with Felicity and Diggle talking to Felicity saying he understands why she’s upset but reminding her of how far Oliver has come. I’d like to see Thea talking to Felicity as her friend and not Oliver’s sister but I wonder if Thea might feel bad about keeping William a secret and so guilt will keep her away some. Laurel I’d like to see with both. I’m reserving judgement about the group not talking to Felicity in this episode until we see the next few, if they don’t talk to her then then that’ll be a foul, but I like it was Oliver and Samantha talking to her in this episode because they were the key players. To be fair to Oliver, he didn’t really tell Thea she found out on her own, but he’s guilty with Barry and it’s like why?! At the time Samantha didn’t tell Oliver not to tell anyone because she didn’t even know Oliver knew so why not take the hair to Felicity and say “I have something to tell you.” and ask her to run it thus there’s no need to lie to her later on. It’s not he cheated on Felicity with Samantha and William happened so while it’s a scary thought to think she might leave him over having a kid, the kid is 10 not 1 so what does he really have to worry about with Felicity? I know the answer is they did it for drama, but I’m just saying. You know…I wouldn’t hate it if Felicity was in the wheelchair for the rest of the series; it would give a rarely dealt with topic screen time and it would be a fresh journey for a superhero show, not counting any show that Oracle shows up on since she was the original big time paralyzed superhero. I know this is an action heavy show so it would be hard for Felicity to run away quickly if need be in scenes, but if they had decided this was her life because the chip helped with pain but never quite worked with mobility then I don’t think I would hate it. I’d love to hear everyone else’s thoughts regarding this. That is a totally fair point about using Thea against Damien by XForce11. Unless someone else became Black Canary I don’t think I could personally buy them doing Oliver/Dinah; I know it is the pairing for those two, but one of the things I’ve notice about “Arrow” is it’s not an exact copy of the comic book characters; Black Canary for example is Dinah Laurel Lance in the comics but on “Arrow” it started as Sara who didn’t even have the famous Canary really (it was mechanic for her versus an actual physical ability with Laurel) then went to a Laurel Lance. Helena Bertinelli’s father as she knows him in the comics is always dead but here he was alive and she became Huntress in the comics not because her boyfriend was killed like on the show but because her family was killed in front of her so there are similarities but they’re not exact copies; plus I couldn’t see Laurel taking him back even with the changes he’s made because she seems to be doing pretty fine on her own and Oliver loves Felicity so she would arguably always be between them. It could also be because I started late in the series and never really saw Oliver/Laurel but I couldn’t see it lasting even if they did get back together which I can’t see to start with. I agree, I love John Barrowman’s performances but Malcolm has to go; we can bring in his good twin Mitchell. It’s the same with Neil and Damien; I love Neil’s work as Damien but he has to go. “The details, the small things, have such large implications for the future” – I did edit this sentence because I love this part; little things can lead to great big plots and they really help build worlds and characters. That’s a fair debate about the ring Emilee; it is one thing to walk away but another to give it back. That was probably for dramatic sake and to make fans worry if they will get married at all. “It’s how she reacted the first time she found out about William in the erased timeline, and that was 30 seconds after Oliver had found out himself. So while Oliver makes too many allowances, Felicity doesn’t make enough.” – to be fair Oliver knew more than 30 seconds so I have to say I’m still with Felicity on he should have told her and asked her to do the DNA test instead of Barry. He hadn’t be given the ultimatum by Samantha yet at that point so why was he so scared to tell Felicity? It’s not like he cheated on her with Samantha and the kid is coming, he’s 10 so why was Oliver lying? Team Felicity on this one. “Since Felicity and Oliver got together, and not counting the erased timeline, there have been very few moments in which Oliver has disappointed Felicity.” – true!